Instant Volume Plumping Gloss from Dior Backstage. 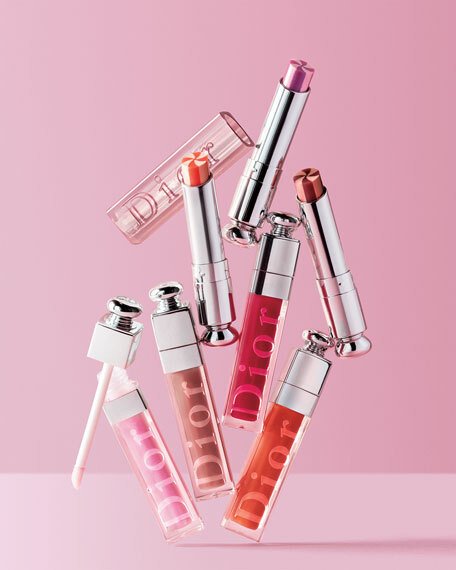 Dior Addict Lip Maximizer plumps lips as you apply for an incredible instant-volume effect. Lips feel soft and smooth, and look full and glowing with a sheer wash of color. Its mint-vanilla scent provides an even more addictive, fresh sensation. Lip Maximizer was born backstage, taking inspiration from pro makeup artists who needed to immediately create a perfectly full runway pout. The expert formula, enriched with collagen, contains a blend of hyaluronic acid and marine-based fillers that leaves lips smooth, moisturized and plump-looking, instantly and day after day. Use as a base to prime, smooth and boost lip volume before adding color, or over lipstick for a touch of shine and a plumping effect. For intensive lipcare, it can be used alone as a 15-day treatment applied daily in the morning before makeup or in the evening. The shades are sheer and natural, with a plumping effect and a glossy finish to enhance any lip. A foam applicator for ease of use and foolproof, perfect volume. Dior Addict Lip Maximizer is transformative. Lips are moisturized, and look instantly plumped and gorgeously glossed. Even the mint-vanilla scent is addictive. For in-store inquiries, use sku #2395637.